If you've been getting the runaround about adjusting your oxygen sensor, it's probably because you have a Wide Band sensor, and until recently there were no EFIE's that worked with them. Finally, there is a fully tested product that works with all wide band oxygen sensors and AFR (Air Fuel Ratio) sensors. This unit is the EFIE of choice for the 4-wire, the 5-wire AND the 6-wire variation. These sensors are very typical on late model Toyotas and other vehicles. This listing is for the dual configuration. This means this device will control up to two wide band oxygen sensors. For vehicles with single wide band oxygen sensors, simply idsregard the second pair of wires. This model comes in a mountable box, and is encased in protective plastic. The wiring is 18 gauge, with quick disconnects that can unplug from the device for easy installation. It has one potentiometer that controls the air fuel ratio adjustment for both sensors. An LED shows when the unit is powered up. 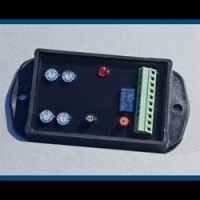 By using the included rubber cap to cover the potentiometer, the unit becomes waterproof. Please note this unit will NOT work with narrow band sensors. For these, you must use any of our other EFIE product lines, such as the Dual EFIE Deluxe. This unit is ready to install. Please contact us with any questions about the correct EFIE for your vehicle.